The Summerlands is a Celtic Pagan Community dedicated to rediscovering, preserving, disseminating, and when necessary, recreating that which was lost to us ... the magick, history, customs, and religions of our ancestors. We are about worshipping and celebrating the old Gods and Goddesses in Ways both ancient and new ... in walking the path that Spirit leads us upon ... in rediscovering our connection with the Spirit of Our People. is a Celtic Pagan Community dedicated to rediscovering, preserving, disseminating, and when necessary, recreating that which was lost to us ... the magick, history, customs, and religions of our ancestors. We are about worshipping and celebrating the old Gods and Goddesses in Ways both ancient and new ... in walking the path that Spirit leads us upon ... in rediscovering our connection with the Spirit of Our People. The Summerlands is the home of the Heartland, the resting place of the Sun, and the reflecting pool of the Moon. Though our focus is primarily Indo-European and Celtic Pagan, all are welcome who come in peace to share our fire. Our goal is to develop a Spirit-based Community that works in Harmony. Our Ways Welcome Your Ways. May we all grow and prosper from the sharing. 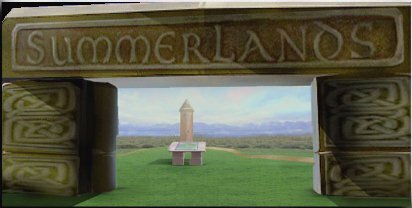 The Summerlands is a Cyber Community, existing within an Other-worldly time and space ... a safe haven for Druids and Witches and Pagans (oh my!) <G>. Join us here, deep in the Greenwood, as we build Our Community and reestablish the Old Ways into the world around us. Come. Enter within. Walk the Dreamways through the dolmen. The snapping of a twig ... the rustling of the leaves send shivers through your soul. Heed the words of the Greenman as the world spins away and The Summerlands await you. Come into the arms of the Goddess and pass between The Paps of Anu as Nature embraces Her lover. since we opened in January of 1997. Copyright 1996 by The Summerlands, Inc.